When I was asked to review this advent book by Franziska at Home, Naturally I jumped at the chance. First, because I love her stories and second because I have a major love/hate relationship with the advent tradition. I love it because I have great memories of a nice big advent calendar hanging over my door as a child. Each day was filled with something sweet, sentimental or fun. Since I’ve become a mother I’ve not done advent well. I either get over ambitious and create some kind of big activity based advent that lasts until about Day 5 or I just get too overwhelmed to begin. I vowed this year would be different and now it will be. 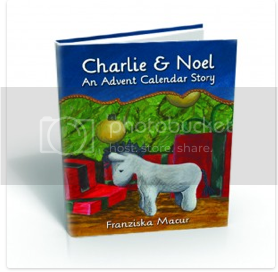 Charlie + Noel is an advent based book with a chapter for each day of advent. The story is about a boy who comes to learn about the true meaning of the holiday season with the help of a little animal only he can see, Noel. The end of each chapter also has links to related readings, crafts and activities. I actually learned quite a lot about Christmas traditions that I’d never heard of reading this book. Franziska says, “Are you looking for a way to travel mindfully through the season of Advent? Do you enjoy reading as a family? Spending some quality time together? Helping your children think about the true meaning of Christmas? Join us on our Advent journey.” At $4.99 it’s cheaper than almost any other advent activity and you can buy it either as a pdf or on amazon. We’ll be reading this book, but in addition to all that, here’s why I’m looking forward to advent this year. 1. I’ve decided to embrace our season away from family. I’ve written about it here, but I have come to realize that though we are far from both of our families we can have an amazing time. Of course the problem was always in my own head because our children are still too small to know the difference. I absolutely love Christmas and, behind the 4th of July, it’s my favorite holiday. We are going to use the next few months as times to shower the kids with fun quality time. Crafts, activities and things that are not stressful. It I start to feel stressed (which is easy for us neurotics) then I’m going to back off and find a new track. 2. I really love Christmas. Not because of the presents but because there is good food, nice decoration and the music. Oh, the music. I channel the teen inside and play Taylor Swift Christmas tunes all day. Don’t send me hate mail, but I’m actively restraining myself from decorating and playing Christmas music.However, in a week or so when I no longer care who is bothered by my desire to celebrate early, I’m going to hang this mack daddy of a fabric find from Ikea. It is big and the snow glows in the dark and I’ve been eyeing it since last Christmas when I saw how Oh Happy Day used it for an advent countdown. We will hang up some crafted felt somthing or other as we read our Charlie and Noel story. Easy peasy and a whole lotta bang for the buck. 3. Our church gets serious. Our pastor seriously hates commercialism and says it somehow every time he mentions the word Christmas. Not that he hates gifts or celebrations, but he hates that the commercialism makes Christmas seem so separate from the “reason for the season.” Each year he challenges our church to think of creative ways to make a difference in our communities. Last year we held a major throwdown in an underprivileged neighorhood nearby and many people established relationships with those who attended that were nourished throughout this year. I even held a progressive dinner at our tiny house with over 20 kids. Ultimately, Christmas is what we make it with our loved ones, both family and friends. I already read stories to the kids every night so I am so excited to have this easy advent storybook that can help us focus on things that are important. What do you do for Christmas advent? Do you have any awesome traditions to share?